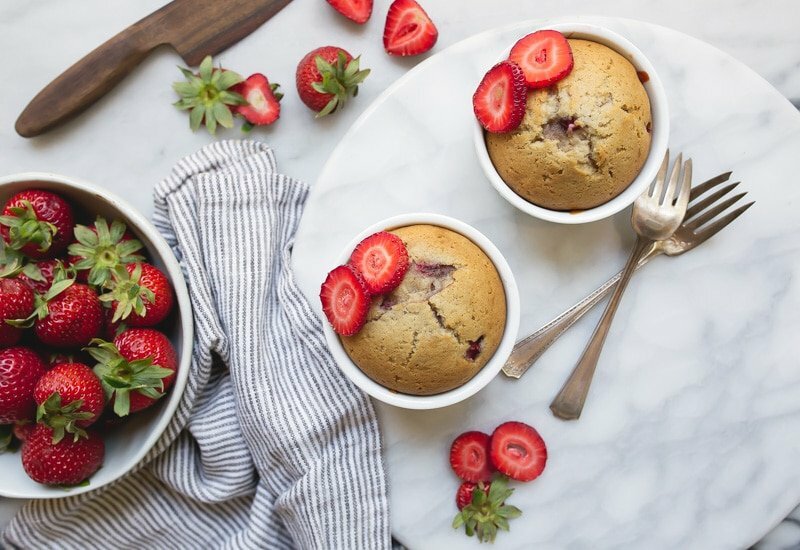 Strawberry cake for two made with fresh strawberries and baked in ramekins. This post is sponsored by the National Frozen and Refrigerated Foods Association, also known as NFRA. See EasyHomeMeals.com for more recipes & tips. The most common thing you and I encounter when we’re scaling down recipes and making small serving desserts for two is the egg conundrum. Are we going to use the egg yolk or the egg white? I have it down to a science when it comes to choosing the egg yolk or the egg white. Recipes on this site are divided by egg yolk only and egg white only. If you’re only going to use part of an egg, you can go to the handy guide to find a recipe to use the rest of the egg. Two desserts from one egg is great, right? Having leftover egg parts when baking can be a little stressful. If I’m baking a small batch of cookies, I usually choose the egg yolk. Egg yolks are fatty and rich, and give a cookie chew and oomph (and oomph tastes very good, if you didn’t know). However, when it comes to cakes, I usually opt for the egg white. An egg white is roughly 2 tablespoons of protein that binds a cake together (like glue!) while also providing moisture and lift. I decided to try my hand at using packaged egg whites, because I can’t deny the convenience! 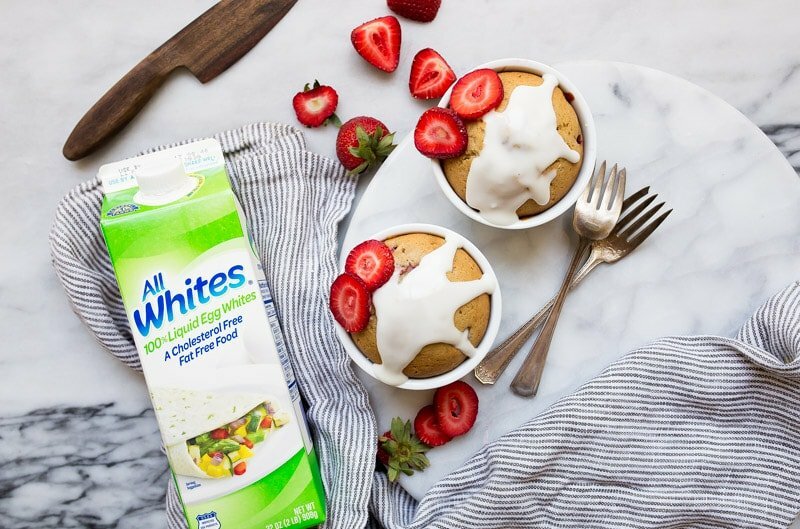 I grabbed a carton of AllWhites® 100% liquid egg whites for this recipe. I’ve seen them in just about every grocery store around the country, so I’m 99% sure you can find them, too! They’re made of 100% real liquid egg whites, and they’re rich in protein, have no cholesterol or fat, and have half the calories of traditional whole eggs. I mean, we’re making cake here, so if we can get a small break on the calories, let’s take it, ok? This recipe is similar to my small funfetti cakes for two, but I used 3 tablespoons of egg whites instead of the partial egg. It worked perfectly. I also swapped baking soda for baking powder, and I love how much these cakes rose and made a perfect dome on top. Each cake has one fat strawberry, finely diced. When the cake bakes in the oven, the berry bits reduce to jammy bits of perfection. Oh, strawberry cake for two. How I love you. 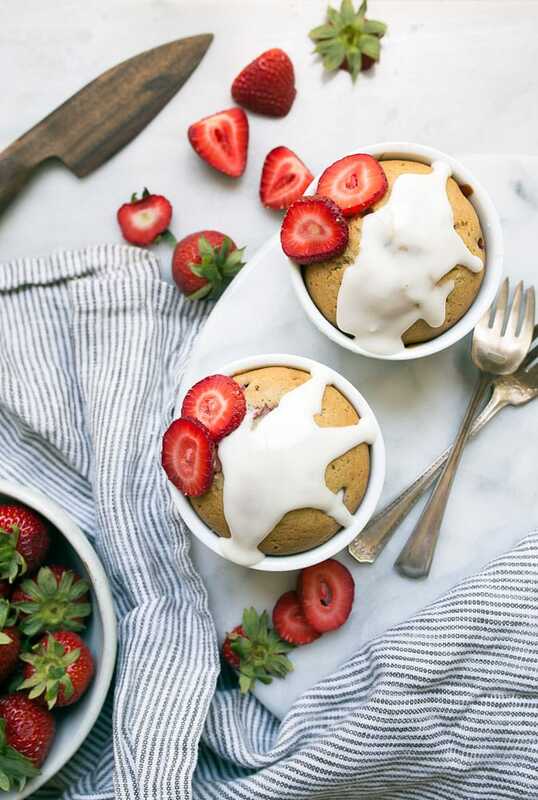 I always put a dusting of cinnamon in the batter, because my Mom made strawberry bread with cinnamon when I was growing up, and it tastes like home to me. You can leave it out—your call. 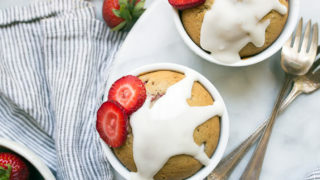 I made a simple cream glaze for these cakes, because there’s nothing like strawberries and cream, but if you’re looking for more strawberry flavor, you can mash strawberries with a fork and stir it into the powdered sugar. If you’re looking for more small cakes for two made in ramekins, can I suggest chocolate cakes in ramekins, lemon cakes for two, or funfetti cakes for two? Strawberry cakes for two made with fresh strawberries. Preheat the oven to 350, and spray two 6-ounce ramekins with cooking spray. In a small bowl, whisk together the egg whites, sugar, oil and vanilla extract. Whisk very well until combined. Sprinkle the flour, baking soda, salt and cinnamon evenly over the top, and stir to combine. Stir in the milk and strawberries. Divide the mixture between the two ramekins, and bake for 24-26 minutes, until golden brown on top. Use a toothpick to ensure the cakes are done. Meanwhile, whisk together the glaze ingredients in the a small bowl until pourable. Drizzle over the cakes and serve. This looks amazing. I love your project of scaling down all the cake recipes to 2 ramekins. They are absolutely perfect. A little (or a lot) of cinnamon is usually the secret in all my baked goods and is nearly never left out. It’s like a little, warm hug. I recently read a recipe for banana bread that said “you can omit the cinnamon if you’d like” and I was like, um what now? No you can not. Strong feelings over here. haha, I love this Allison! I 100% agree with this!! These are adorable and delicious! 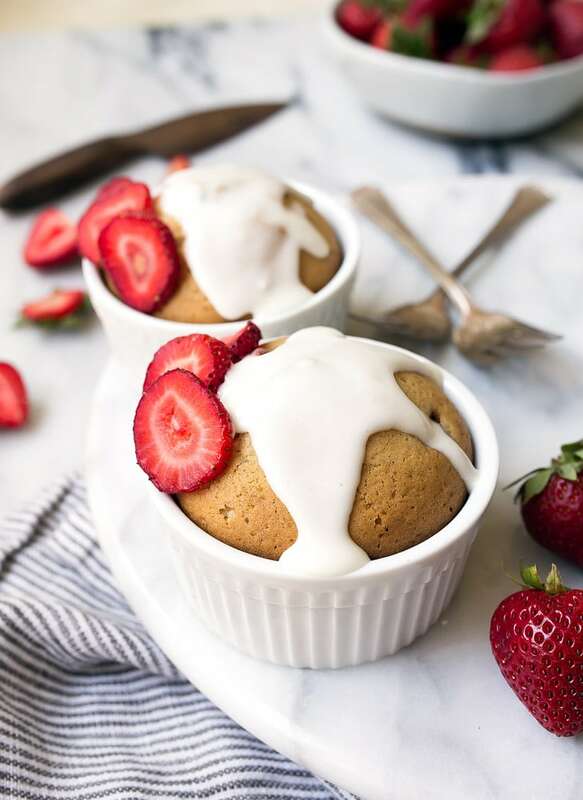 I love when strawberries bake to jammy perfection, and that simple cream glaze on top. Gah. I am so happy it is strawberry season here too! I know what I’m making for date night dessert next week! Loving this pretty summery cakes!! I never think to make liquid egg whites in cakes! One of the first things I noticed about your most recent cookbook is that you had a whole list of suggestions & recipes for what to do with leftover egg whites/yolks, which I so appreciate! This will be our dessert before the week is out…. I would love to make this for my daughter who will be 10 months old this Friday. I don’t have 6 ounce ramekins. Can I use 6″ mini cake pan (2″ high sides)? I’m sorry, I don’t know Dhimas. I only tested this recipe the way you see written. I really like your idea about having a little dessert everyday. That way you get to both create something and enjoy the fruits of your labor. These are in the oven for breakfast for my 4 and 6 year old. Best or worst mom? I just put this cake in the oven. My sister made your bread puddings and creme brulee so we had leftover egg whites. Instead of using only strawberries I used mixed berries and we had no vanilla so I used lemon extract. I had a lot of egg whites (12T), so I quadrupled the recipe (only 2tsp of vanilla though) and baked it in a Loaf pan for about 70min until it was 210F inside (tenting with foil after it browned). It was delicious!